If there was ever a slot game that just communicates chaos, carnage and excitement purely through its name then it has to be Cash! Bang! Wallop! by leading slot developer, Ash Gaming. Ash Gaming has been criticized in some sectors of the gaming industry for taking the safe path too easily. Their jungle-themed Amazon Wild did have 100 paylines but was very one-dimensional, its King Arthur slot is not exactly an untested theme, and Angel or Devil is the stereotypical good-versus-evil slot. This is why Cash! Bang! Wallop! is a step in the right direction for the developer. There's Fireworks with 118,700 Ways to Win! 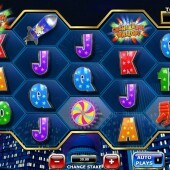 Perhaps the most amazing attribute of this thrilling 5-reel slot is that there are a mind-blowing 118,700 ways to win. I am not even going to begin to start saying how you can win but with so many ways to win the next win is always only just around the corner. 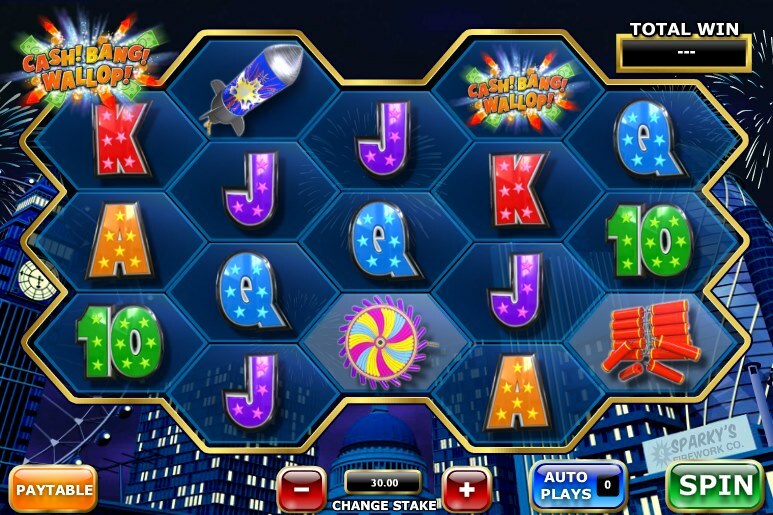 Symbols in the game include the regular 10-through-to-Ace symbols with the remaining symbols on the reels made up of different fireworks such as sparklers, Roman candles, rockets, tridents (not the nuclear submarine type! ), Catherine Wheels and Chinese bangers. After ever spin, there is the chance that Sparky McFlame might appear on the reels. He will then ignite one of the fireworks symbols on the reels that will then light up and turn Wild. Every winning symbol in a combination involving that Wild will then explode and new symbols will fall into their place to replace them creating the potential for more winning combinations to be made. To add to the carnage, each rocket will have a different impact on the game when they explode. For example, the sparklers can turn up to four symbols Wild when they explode, the rockets will fire across the reels and turn symbols they fly past Wild and the Catherine Wheel will turn every symbol it is touching Wild too. Furthermore, the game comes with a Firework Win Streak Bonus. This is triggered when the Bonus Crate symbols appear on Reels 1, 3 and 5 at the same time. You will get five new fireworks with every crate that appears. Sparky McFlame will then light each firework and you watch the ensuing action take place before your eyes as the fireworks are lit and turn symbols Wild all over the reels. Cash! Bang! Wallop! is without doubt one of the most intense slots on the market and Ash Gaming have created a top title. Some veteran slots players might find the game a bit too frenetic but players who have enjoyed playing NetEnt’s explosive Wild Rockets slot or the same developer’s Starburst slot will certainly get a kick from playing this slot.